I think I have discovered the problem with FinTech. 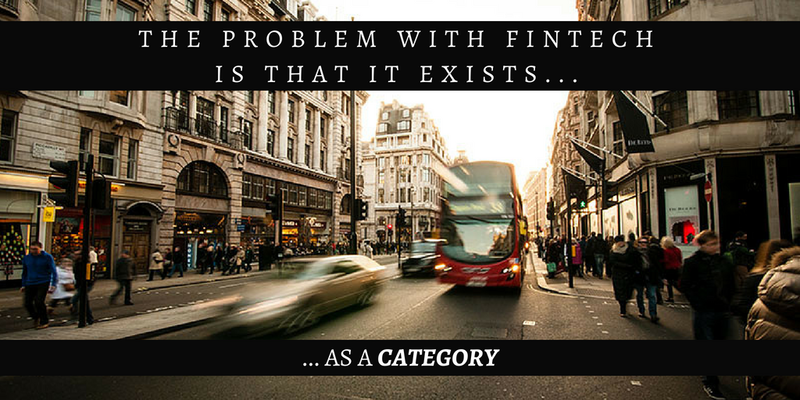 The problem is that FinTech exists. By that, I mean that it exists as a category. Because as soon as it exists as a category, it implies that there is an alternative approach. Financial Services has been a technology business at least since I first got involved in it in the early 1990s. One of my first vacation jobs, as a student, was loading data tapes on those old 'reel-to-reel' drives in the basement of a large insurance company. My first full-time job was distributing software to be used by financial advisers. Almost every financial services job and engagement I've had since then has had technology in it to at least some extent. I've heard financial services executives say "we don't want to become a technology company", as well as "you can't win the technology" game. Well, perhaps you have to become a technology company in the sense that, for example, Amazon is both a retailer and a technology company? And perhaps the only way to win is to win the technology game? 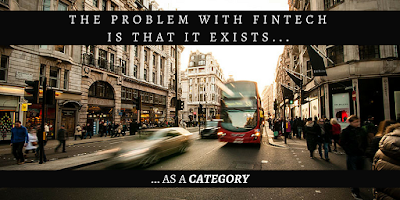 Clearly, there is a category of FinTech startups which may disrupt the incumbents, either as competitors or as suppliers, but are they not just financial services startups and innovators? I think it is time we stopped talking about FinTech as a sub-sector, and about FinTech versus non-Fintech, and just started talking about good use and management of technology in financial services, and bad use and management of technology in financial services.